Corsair has become the ninja of case manufacturers. Not only does it excite the market out of nowhere, causing the traditional companies to wonder where the hell that came from, but it's also made from elements of black hole in its extreme matt blackness, making it impossible to photograph. I promise to throw the case down to our photography department for the real review, but these were done Friday afternoon in a much smaller studio. 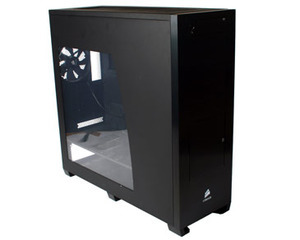 What the 800D part currently means is only known to Corsair right now, but the Obsidian Series case is designed to be its "Dominator GT" of PC enclosures: it has all the bells and whistles to make your other hardware go faster... well, that's the best way to think about it. The final product is an all black (and we mean all) beast about the size of a Cooler Master ATCS 840. There are no bling lights - it could not get more discrete and unassuming unless it came with its own towel to hide it under. With its decidedly dark heart explained, now onto the specifics: most of the case is made from ABS steel, which is thicker and stronger than your usual case sheets, but it also makes it damn heavy. 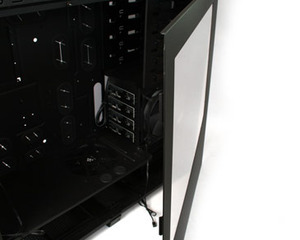 We're talking Antec P190-series heavy. The front facia, including the hot swap hard drive door is 3mm brushed aluminium sheet that is mounted on plastic behind. The whole thing is extremely sturdy and will withstand the test of movement and time, although we'll wait to unleash the might of Harry on it before we commit to a final opinion. From the outside it looks particularly gorgeous if you enjoy your cases very angular and neat. Corsair's flair extends to its logo in the front and a perspex case window in the side. 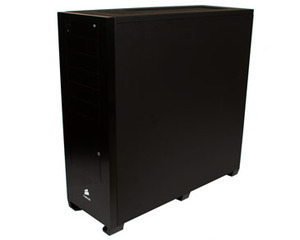 The three feet on the bottom are also metal and surprisingly sturdy considering they are actually angled slightly inwards, but the centre of gravity should be lower since the PSU sits in the base. 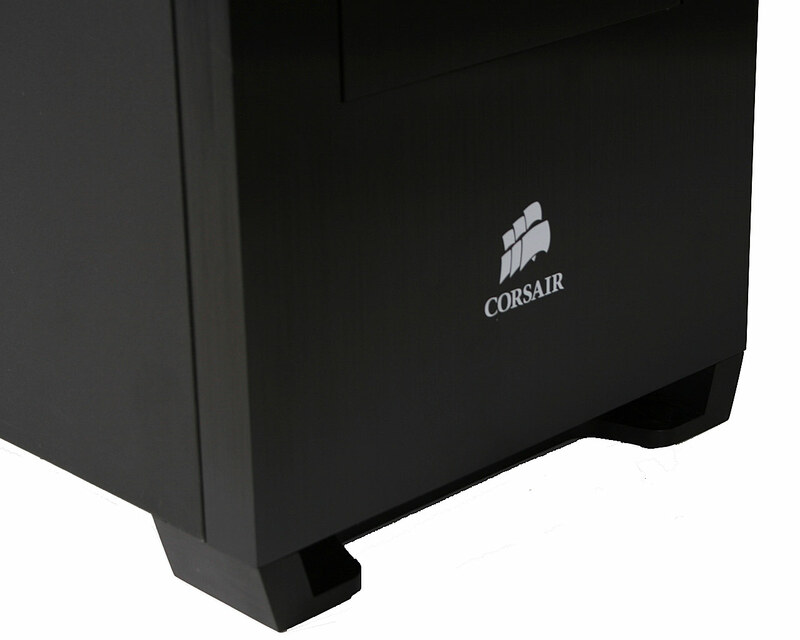 These feet offset the chassis about an inch from the floor, which is needed considering that its only intakes are through the floor. The quality of paint finish is very good, and everything metal feels solidly put together - a definite good sign to start with. 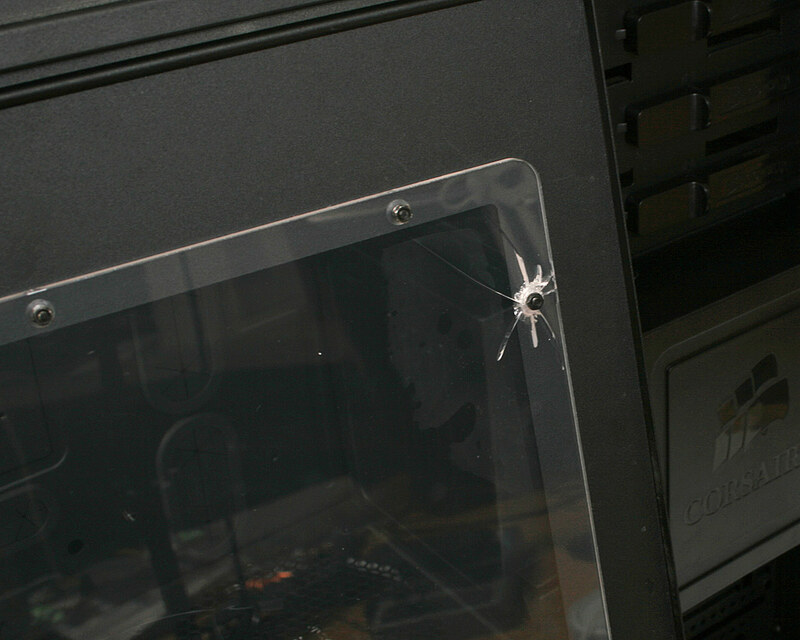 Corsair even attempts to "bring back" the case window with a well integrated and smooth finished piece of perspex. Unfortunately, the sheet is thin and feels flimsy, and evidently either didn't survive the side panel flex during transportation, or someone overtightened that screw back in China.